This two part webinar series will help you learn and use DriveWorks Solo. We will build a complete design automation project from start to finish and you will see how easy it is to master DriveWorks Solo and to boost your productivity. Once you have downloaded and installed DriveWorks Solo, you should also download the training files and the training manual PDF from the DriveWorks Community. With these documents, you’ll be able to recreate the project we are building today. We welcome questions throughout and after the webinar. This first session will take place at 4pm GMT on Monday, 29th April. 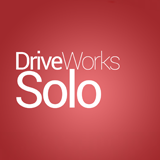 Join us to learn about DriveWorks Solo. Find the webinar time in your timezone here.